Lawyer/politicians like Abraham Lincoln and William Seward understood the need for military operations to save the Union, but they also realized that the strength of the Union lay in good laws, justly administered. Lawyer/politicians like Charles Sumner and Salmon Chase saw in the carnage of the war the promise of a new kind of Constitution, based on citizenship for all Americans. Their commitment to law gave all four of these men, and their comrades in Lincoln’s cabinet and the US Congress, a will to victory that reports of losses from the field and defections from their party could not dull. On the Confederate side, a legal regime based explicitly on the protection of slavery gave temporary comfort to some lawyer/politicians like Alexander Stephens. But even he yearned for a return of law and order, and when peace came, he readily returned to his legal practice. Equally important, he and his fellow Confederate lawyer/politicians accepted the terms of lawful surrender, and signed the docket books of the federal courts to prove their renewed loyalty to the United States. Some writing in bold strokes, some in hands shaking with age, they recommenced their legal careers. Mark Twain wrote that comparisons were odious, but they need not be malicious, and sometimes they are useful. Can the lawyer/ politicians’ performance in the Civil War tell us anything about the role of the lawyer/politi­cian in the United States’ system in the present constitutional crisis? Today, and for the past two decades, the US has been perpetually at war. Hot wars in the Middle East, cold wars of words in East Asia, and endless rounds of war with terrorists abroad and at home. Started by politician leaders whose background is business, they have at times profited in certain business enterprises, but in no case have they led to a resolution of hostilities. Absent from them is a vision of a world ruled by law, according to law. This is not an accident. Today legal historians among these scholars have much of worth to say, and have been offering it freely, if only the political leaders would pay heed. Law promotes resolution of conflict. Law teaches its practitioners how to find an end to disputes. Sometimes that path is adversarial. Other times it rests on mediation or arbitration. Whatever path it takes, legal reasoning, litigation, and judging all lead to an end to conflict. When the United States as a nation choose leaders who lack background, training, learning, and trust in law, the ideals of a law-abiding nation are lost. The US became an aggressor, a sovereign version of a mugger, whose only goal is immediate gratification of violent impulses. Law constrains animosity and provides the basis for resolution of conflict. An abandonment of law to the desire to enrich ourselves, or satisfy the desire for revenge, leads to excess that has no ending point. In the present days of tweets and retweets and social media accusations without consequences in libel law, threats and territorial impositions without regard to international law, and actions at the very top of government that seem intentionally indifferent to Constitutional law, the United States is in desperate need of legal leadership. A high court that seems perpetually divided, and worse, divided along partisan political lines, cannot provide that leadership unless it sets itself to the task. A president beset on all sides by lawsuits, working in the shadow of an indictment of obstruction of justice and an impeachment movement, is unlikely to provide that leadership. A revolving door of White House and personal legal counsel hardly sets one’s mind at ease about the prospect of legal leadership. A Congress, replete with lawyers, but bent on disregarding legal precedent and unable to agree on legislation, with members accused of various misconduct departing in droves, is not a source of legal leadership. Where, then, can one find it? The obvious place is where one should start, with the legal profession itself. Although taught to defend clients zealously, and occasionally given to overstatement on their behalf, lawyers are the best and perhaps the last resort when legal crisis looms. Lawyers for the public interest, lawyers for the “usual suspects”, and lawyers for the justly aggrieved enable democracy to work. Even though as a profession the law ranks low in public esteem, lawyers like Robert Mueller are the direct descendants of the Lincolns and even farther back, John Adams, John Dickinson, Alexander Hamilton, and Thomas Jefferson—all lawyers. Looking at this lineage of lawyer/politicians who founded and saved the United States’ republican system leads us to reexamine our history, and, from that perspective, to see another group of women and men entrusted with our best tradition. Historians are sources and repositories of national wisdom. Today legal historians among these scholars have much of worth to say, and have been offering it freely, if only the political leaders would pay heed. One thinks of Annette Gordon-Reed, Noah Feldman, Lawrence Friedman, Cass Sunstein, and Mark Tushnet in the law school ranks, Jeffrey Rosen, Jeffrey Toobin, and Linda Greenhouse among the journalists, and Eric Foner, Sean Wilentz, and Julian Zelizer among the many historians whose contributions to the national dialogue on US law in its historical context are precious. Featured image credit: Courtroom One Gavel by Joe Gratz. Public domain via Flickr. Peter Charles Hoffer teaches and writes legal history at the University of Georgia, in Athens. 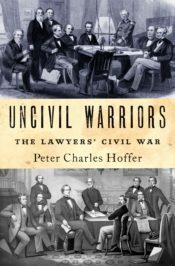 He is the author of Uncivil Warriors: The Lawyers' Civil War.